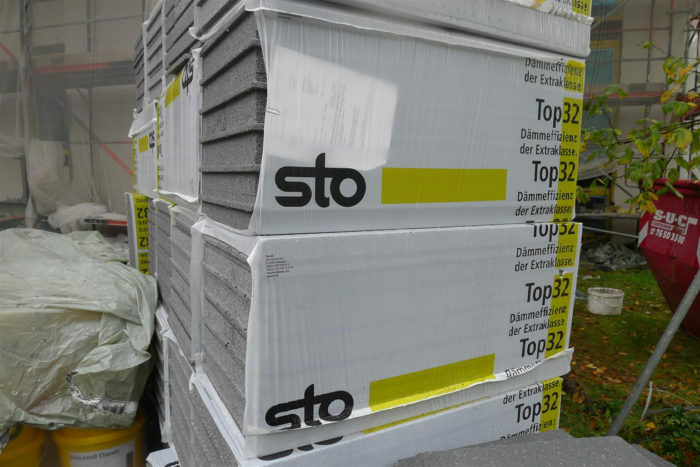 The most common type of rigid foam used in Germany is EPS. Dark-colored types of EPS include graphite, which increases the material's R-value per inch. 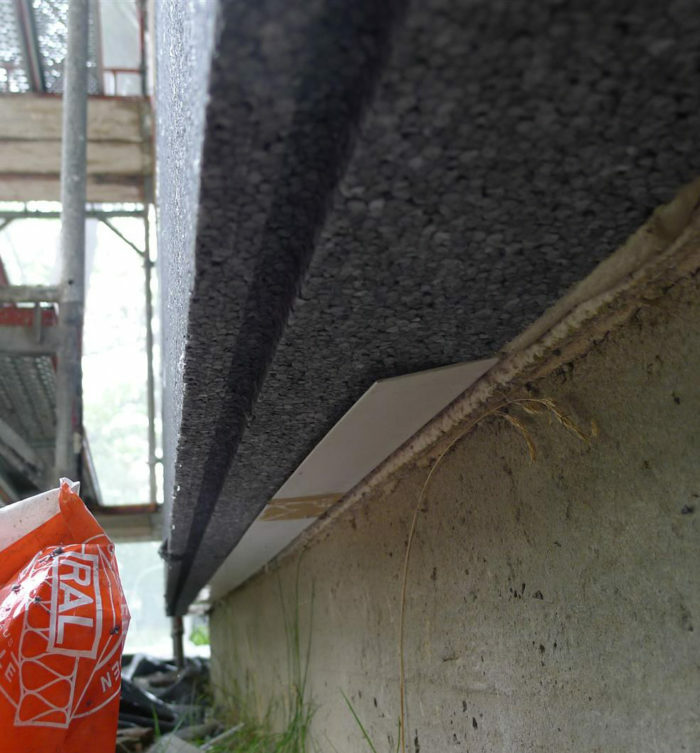 Tongue-and-groove edges reduce air leakage. 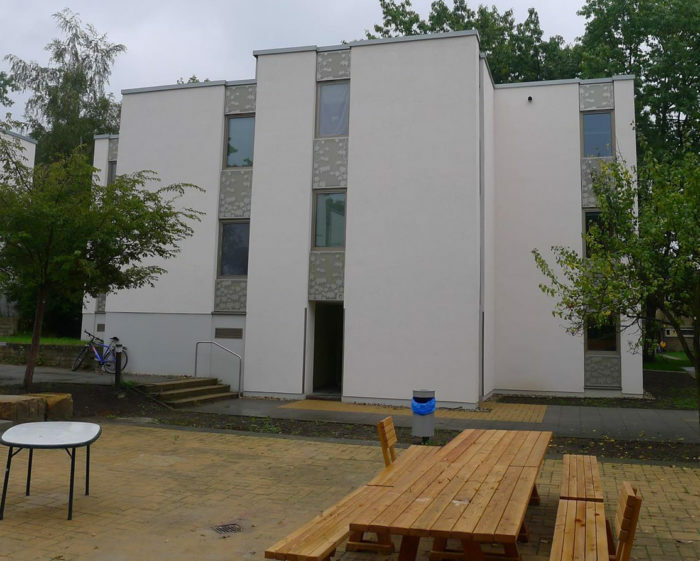 Image Credit: All photos: Andrew Dey Built in the 1960s or 1970s, this university dormitory in Berlin is getting a deep energy retrofit. The EPS foam used on this job was manufactured by Sto. The exterior rigid foam rests on a horizontal plastic angle that serves as a starter strip. 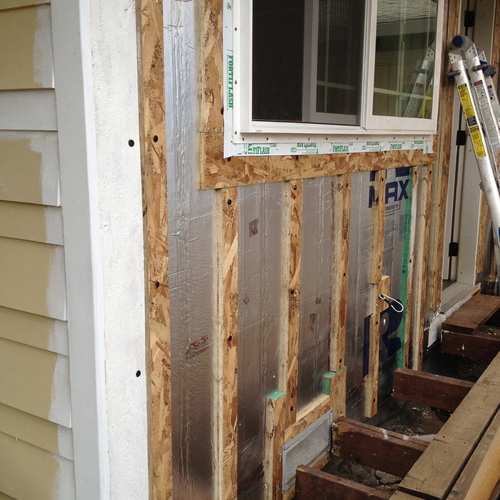 Another view of the plastic starter strip that supports the exterior rigid foam. 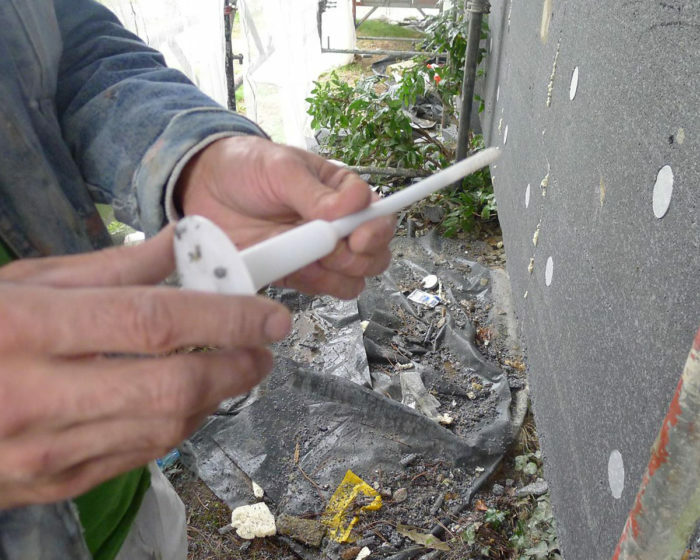 The pieces of rigid foam are fastened to the concrete wall with special plastic anchors with large integral washers. Detail of a window recess. 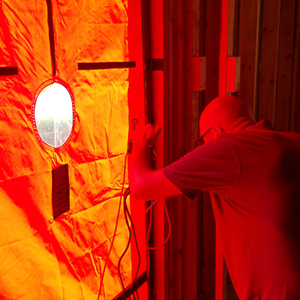 Membrane and black goop were installed around the windows. 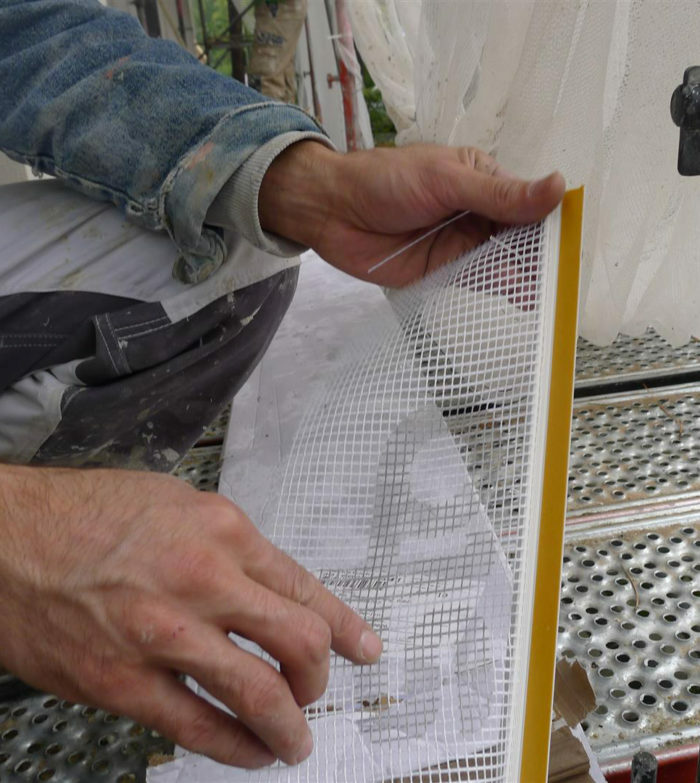 The window returns were finished with strips of mesh that include an integral adhesive strip. The window return mesh is adhered to the window frame. Mineral wool insulation was used instead of EPS near the chimney. Photo of a completed energy retrofit project using the same EIFS approach. I am a big fan of German window sills, often made of thick aluminum. I recently visited a job site on the outskirts of Berlin that had previously caught my eye. 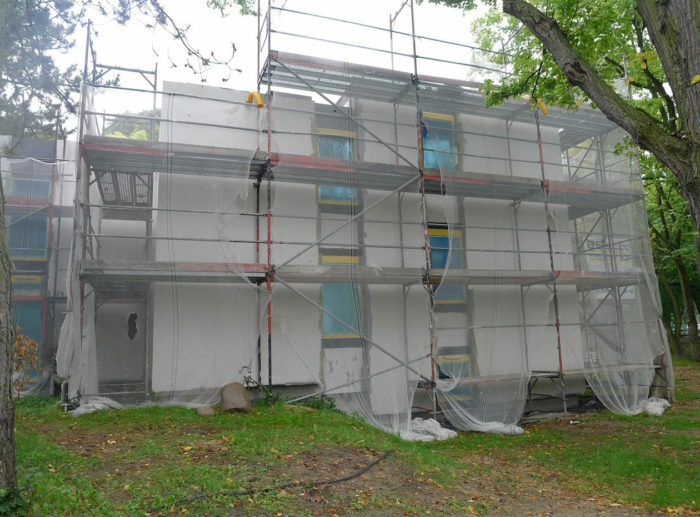 Although the buildings were shrouded in the usual scaffolding and screening, I had noticed while biking by that the work involved “energetische sanierung,” or energy retrofitting. 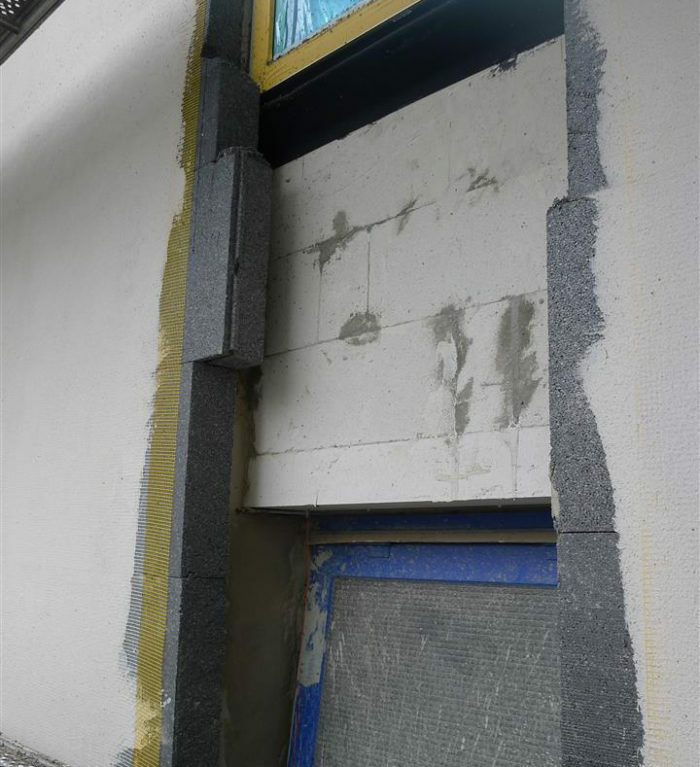 The photos on this page illustrate various details of the insulating skin installed on this building. While the materials and techniques used on this project are run-of-the-mill for Germany, they may be of limited applicability to projects in the U.S. Nevertheless, I like to think that sharing them might contribute to innovative thinking for someone, somewhere. 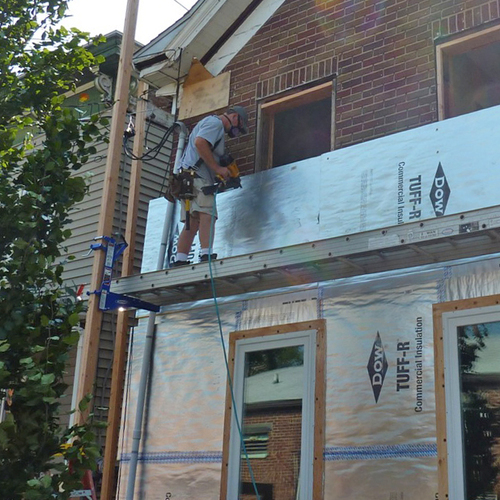 The materials and methods being used on this retrofit project are similar to those I have seen on many other job sites in Berlin — both retrofits and new construction. The big players in exterior insulation and finishing systems (EIFS) provide integrated suites of materials, accessories, and stucco products for this type of work. Sto, the manufacturer of the products being used on this project, is one of the brands I see often. As I approached the job site, I found two workers using hand saws to trim rigid foam blocks that they had installed around new windows. I asked if I could take some photos, explaining that I was a project manager from the U.S. who was interested in energy efficiency. As often happens in this situation, the workers’ initial reticence gave way to a quick tour of the work and informative answers to my questions. The building appeared to have been built in the 1960s or 1970s. It was part of a student housing complex associated with the nearby Free University of Berlin. The original walls were cast concrete about 8 inches thick. On this project, 120 mm (4 3/4 inch) thick blocks of expanded polystyrene (EPS) were being installed on the original masonry walls (see Image #3 below). 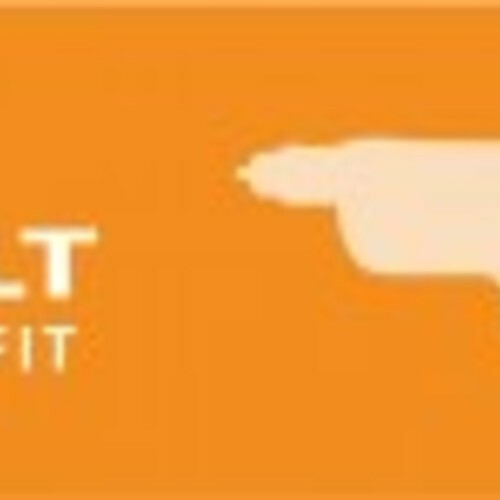 In the U.S., one can readily purchase different types of rigid foam in 4’x8′ sheets. 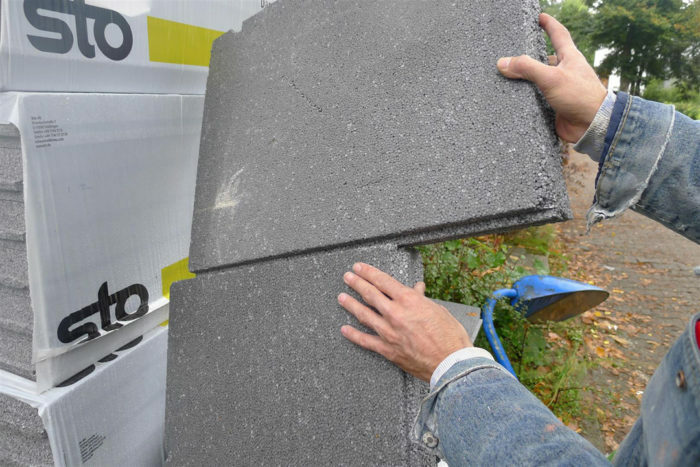 In Germany, on the other hand, EPS is by far the most common type of rigid insulation, and it is sold in relatively small but thick blocks. From what I have seen, mineral wool is a distant second to EPS. 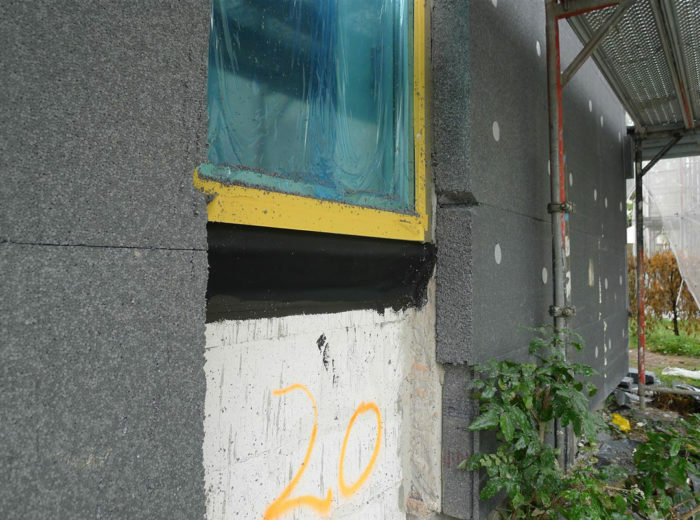 The only extruded polystyrene (XPS) I have seen was being used below grade on foundations. I have yet to come across any rigid polyisocyanurate board on construction sites here in Germany. The blocks of EPS foam are configured with tongues and grooves around their edges to facilitate air sealing (see Image #1, above). The site supervisor told me that the grooves are a relatively new innovation from Sto. In fact, on most other job sites I have seen, the foam blocks are square-edged. 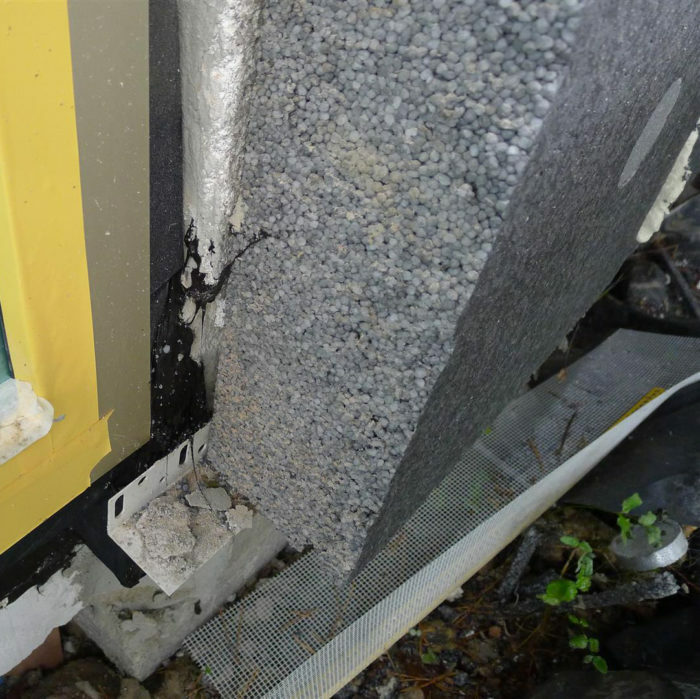 Any gaps between the blocks of EPS foam are filled with one-part expanding polyurethane foam. 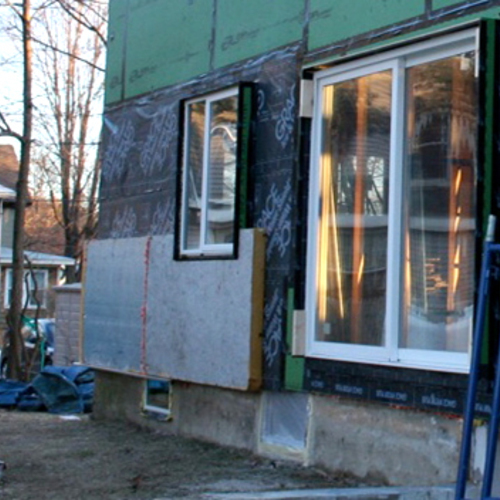 Installing the blocks of EPS is relatively straightforward. Lengths of plastic angle are fastened level at the bottom of the wall to create a guide for the blocks (see Images #4 and #5). Because each block is mechanically fastened and bonded to the wall, the bottom ledge does not have to be load-bearing. On most other retrofit projects I have seen, the heads of the anchors are installed flush with the surface of the foam block, and simply covered with stucco. Countersinking and plugging the fasteners minimizes thermal bridging at the fasteners, and presumably also prevents telegraphing of the fasteners through the finished stucco. The anchors used on this project are locked into place by driving the screw that is integral to the fastener. Another type of fastener that I have seen relies simply on plastic barbs gripping the sides of a tight hole in the masonry. Because these particular buildings are simple in form, applying a skin of rigid foam was straightforward. The only areas that required special detailing were where vertical bands of glazing had run continuously through all the floors. As part of the retrofit, these bands were replaced by windows at each floor level (see Image #7). Masonry lintels at each floor level support lightweight (aerated) concrete block infill walls, above which the new windows were installed. The windows were flashed on all four sides with membrane strips bedded in black goop (see Image #8). Once the foam had been trimmed at the edges of the windows, strips of mesh with a plastic bead were adhered to the window frame to allow the window returns to be stuccoed (Images #9 and #10). 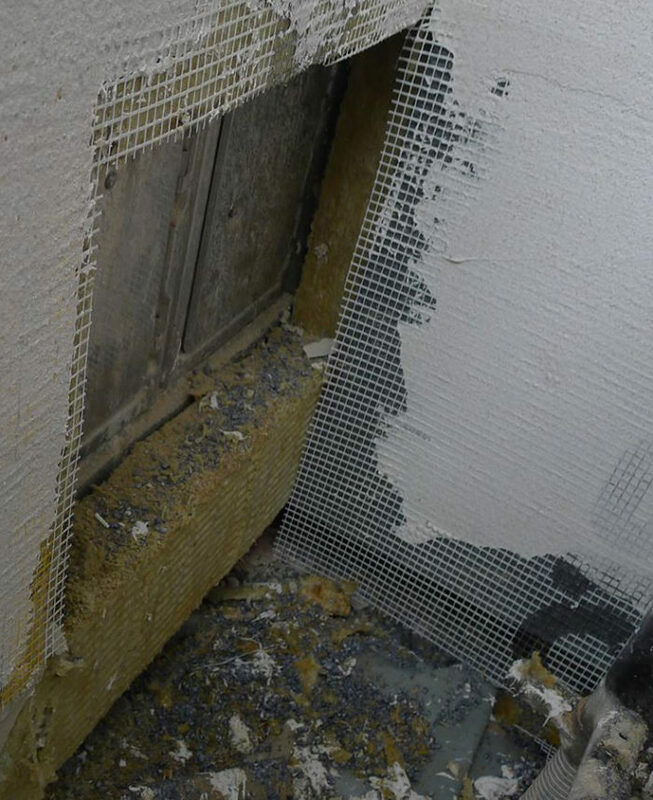 Corner bead with preapplied mesh was installed on the foam at exterior corners. The only place on this building where mineral wool batts were used instead of EPS foam was around the enclosure for the chimney that vents the boiler (see Image #11). The site supervisor told me that the nonflammable mineral wool is also generally used to insulate facades adjacent to other buildings, to mitigate against the spread of fire from one building to another. The site super told me that if I wanted to see what these buildings would look like when finished, I could visit a completed project nearby. He gave me directions, and off I pedaled. The completed buildings appeared to be nearly identical to the ones that I saw being worked on (see Image #12). I saw that the vertical alcoves between windows were finished with decorative metal grilles. In addition to infilling the recesses, these grilles added visual interest to facades that were otherwise quite plain. 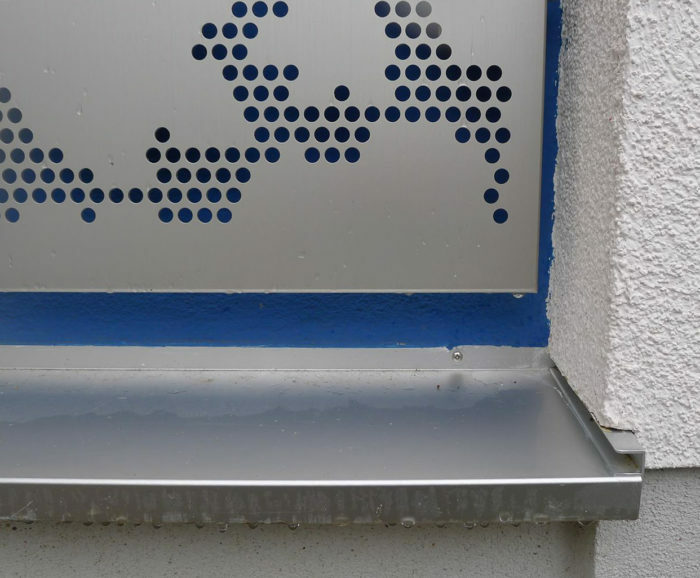 The sills under the metal grills were a variation on the wide, sheet-metal window sills typically found on buildings here in Germany (see Image #13). Thick building walls require wide sills. Typically the sills are made of a single piece of metal with the edges bent up and around at each end. On this project, each sill consisted of an aluminum pan that had been slid into extrusions at each end. Having repaired or replaced my share of rotten wooden window sills in New England, I am a big fan of German window sills. 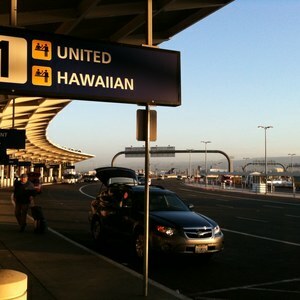 However, their distinct style probably limits their applicability to retrofits in the US. They work well with stucco exteriors, and I could imagine them fitting in on a contemporary house with wood siding, but their “look” may have to be modified for them not to appear out of place on an older New England home. While most of the retrofits I have seen in Berlin are being executed on multifamily and commercial buildings by professional contractors, in residential areas outside the city I have encountered homeowners themselves tackling such projects over multiple weekends. During a recent visit to a large DIY home center, I saw that all of the materials required for these retrofits are readily available, including foam blocks, accessories, stucco, and installation tools. 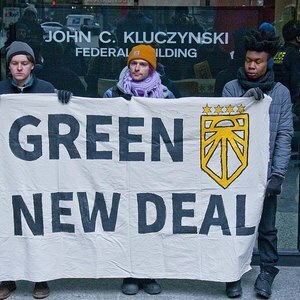 Most of the deep energy retrofits with which I am familiar in the U.S. make use of either 4’x8′ sheets of rigid foam, or closed-cell spray foam, to create an insulating skin on the building’s exterior. The R-etro system from Canadian ICF manufacturer Quad-Lock Building Systems is the closest analogue I have found in the U.S. to the EIFS systems used throughout Germany. I can see both benefits and disadvantages to utilizing a system of small but thick blocks of insulation, as opposed to large sheets. As I think about the insulation options for retrofitting the exterior of my 1840s farmhouse in New Hampshire, I am leaning toward using rigid batts of mineral wool. I too love the mettle window sills. I think there is a way to use that in the USA. I also love the idea of T&G thick insulation in smaller block. Thanks it was ver information. Thank you for these blogs Andrew. 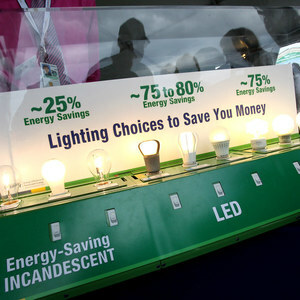 It's great to learn about the different products and techniques employed in Europe where they are really approaching energy efficiency head on. Also, very interesting to see the little details around windows and such. I look forward to more posts. 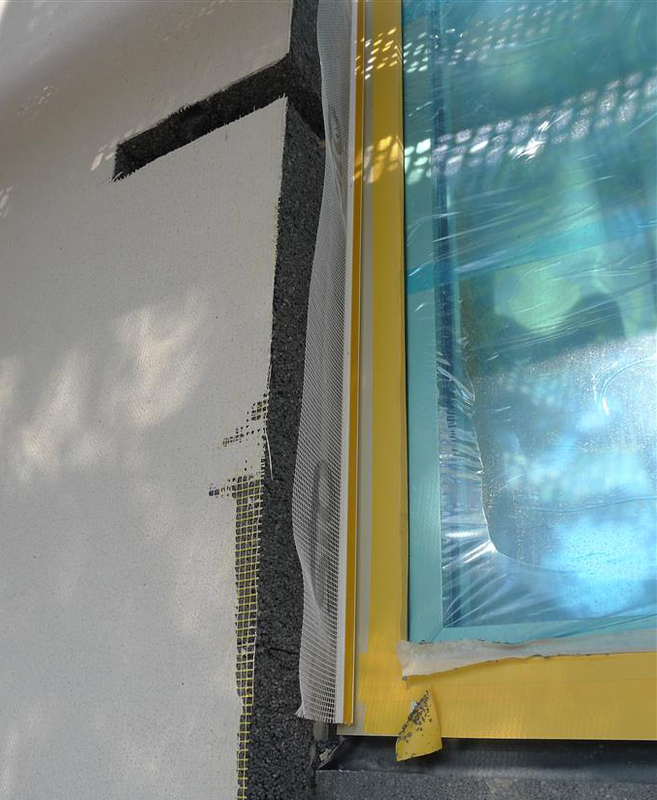 Does one know where I can find the strips of mesh with the adhesive that can adhere to the window frame to allow the window returns to be stuccoed? It looks like a neat product but is it a European-only product or do they sell it in the USA? Judging from what was shown here. It appears that doing a stucco return is possible by utilizing the stick on mesh. I will check with Sto but that's what appears has been detailed here in this article. I was trying to find a way of doing a stucco return all the way to the window frame but without EPS rigid foam around the window frame area, it was proving difficult. I believe this product may have solved my dilemma. I've seen this type or very similar type of retrofits on youtube, and it seems to be popular in many european countries ...i've watched a few french tubes with almost identical methods used. It seems to be a very efficient, non invasive and relativly non expensive way to to achieve "“energetische sanierung " work. On another note, this is almost solely used in conjunction with stucco/acrylic finishes. The Quad-Lock Retro product has 1 major key difference , it adds fastening strips to install any type of exterior finish ( but it is probably more expensive ) . "deutsch" windows, where usually a large interior window trim in wood makes up for the conductivity of the pan up to under the window frame.